New coordination/balance test app and training app for consumers, the health conscious, recreational and performance athletes, personal trainers and physical therapists. 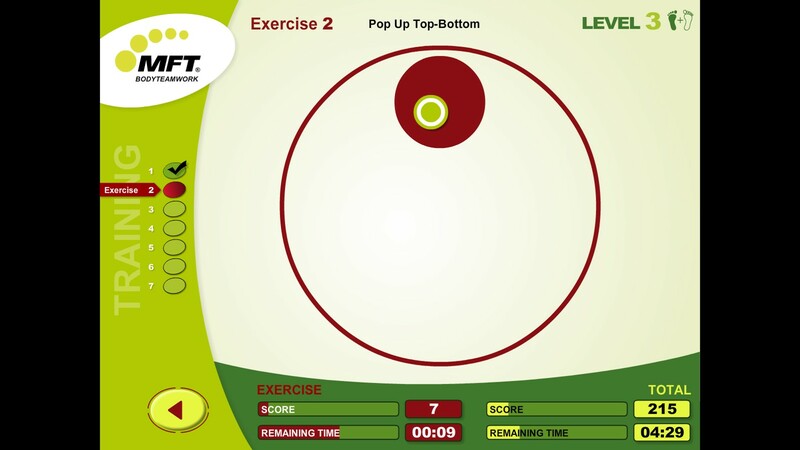 The MFT Challenge Disc app will improve your coordination and balance. It will help balance your lateralities, prevent overload and improve your athletic performance. You can train anywhere with the MFT Challenge Disc: at home, at work, at the gym or at the physical therapist’s office. Good coordination/balance is the result of active and regulated movement control. That’s why it’s important to actively learn how to initiate, stop and reverse movements in various axes of rotation. The smaller and more refined the equalising movements are, the better the coordination, balance and laterality become, making a positive contribution to your health and performance. A coordination test shows your personal performance level, allowing you to discover how to optimise balance requirements. During a single-leg coordination test, the laterality determines one leg’s capacity and compares it to the other leg’s capacity. A laterality of less than 10% is the basis for a healthy load on the spine and joints. Five training and therapy programmes for dual-leg and single-leg training provide motivation for high-quality, effective training. The digital coach helps everyone from novice exercisers to athletes monitor their training progress and optimise their training quality. The result is increased performance, healthy joints and a healthy back. The app offers 6 training games which are also divided into dual-leg and single-leg exercises and provide fun training for young and old alike. Depending on the game, the axes of rotation front-back, left-right or combined are trained in a targeted manner. The following games are available: Ping-Pong, Cross, Butterfly, Ski Racing, Football, Auto Racing. The app’s test results and standard values evaluate your coordination/balance and laterality and point out deficits in the same. The results and values can be saved in a score list, emailed as a PDF file and/or printed. Saving of the test results as a PDF in iCloud, etc.